*Please note that druzy quartz centerpieces are natural stones and may vary slightly in shape, size, and color. Harlow is an elegant medical ID bracelet featuring cherry quartz, pink chalcedony, Peruvian opals and a natural pink druzy quartz centerpiece with 22 karat gold leafing. Pair this gorgeous interchangeable medical alert bracelet with your custom-engraved LH medical ID tag for safety with effortlessly elegant style. This bracelet is suitable for everyday use including hand washing and bathing. 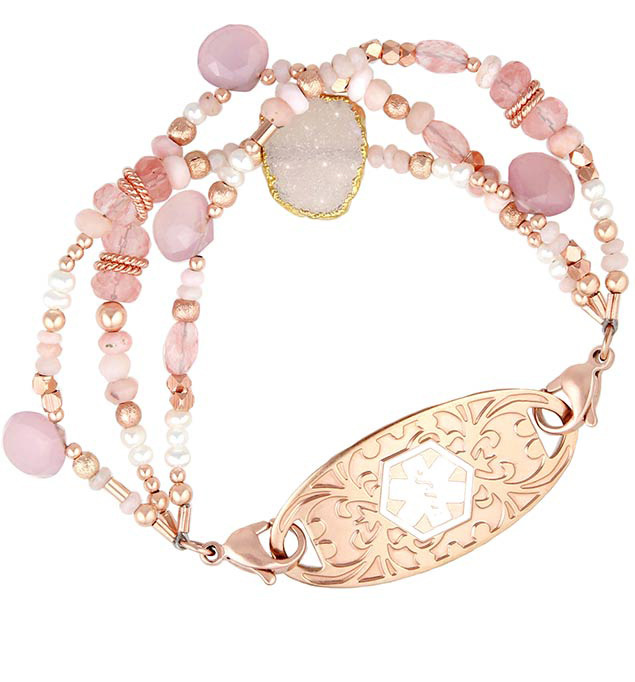 You’ll be pretty in pink while staying safe in style when you wear the Harlow Medical ID Bracelet from Lauren’s Hope. Feminine and on trend, this pink medical alert bracelet is ideal whether you wear your med ID for lymphedema, adrenal insufficiency, steroid dependency, stroke history, diabetes, autoimmune diseases, or any other chronic medical condition. Choose the style of medical alert bracelet and medical ID tag you prefer, and we can custom engrave your medical and emergency contact information. Additionally, because Harlow is an interchangeable medical alert bracelet, you can remove your ID tag and affix it to any other interchangeable Lauren’s Hope medical alert bracelet to suit your mood or activity. We'll custom size your bracelet for a fit that's not too tight or too loose. Snugly measure your wrist, and select your wrist size. Round up if your exact size isn’t shown. We'll add the appropriate length for a comfortable fit. Whether you are ordering a bracelet with a tag OR the bracelet portion only, we will accommodate for your tag.